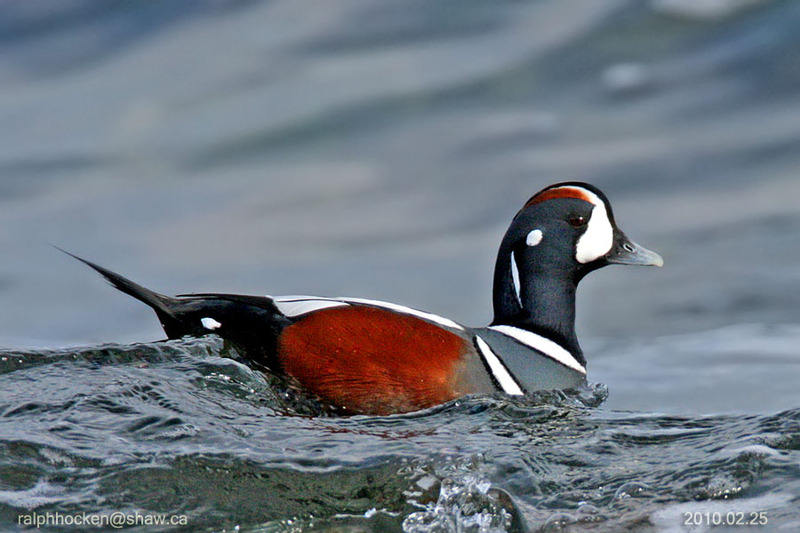 Harlequin Duck: Ralph Hocken Photo. There were 3 hardy birders for the Tuesday bird walk to Rathtrevor Park. The morning was cold, but with some sun and only a small breeze on the water. Highlights were seeing Trumpeter Swans flying overhead, several Varied Thrush and also several Winter Wrens. The Tuesday birdwalk to Little Qualicum River Estuary was fairly sunny with a slight breeze. A couple of highlights were sighting over 40 Trumpeter Swans and 25+ Eagles at the mouth of the Little Qualicum River. A Clark's Grebe was also sighted. 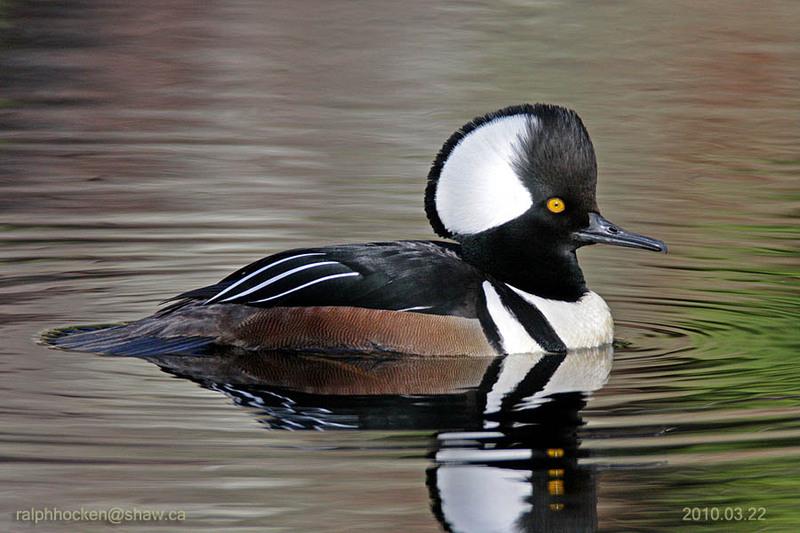 Next Tuesday's (Nov 22nd) bird walk will be to Rathtrevor Provincial Park. In Neil's absence I've volunteered to send you the Tuesday Birdwalk counts so you can post them on your blogspot and disburse to the email listing. Also, Paul and I went to Deep Bay Sunday (Nov. 7/10) and were lucky enough to site a Snow Bunting flitting around the grass and sand by the point. Snow Geese were still sited at the Parksville Community Park. The morning was cool and rainy with some high wind gusts, keeping most birds hunkered down out of sight. However, we did get a really great view of a Red-tailed Hawk as it sat perched atop an old log. 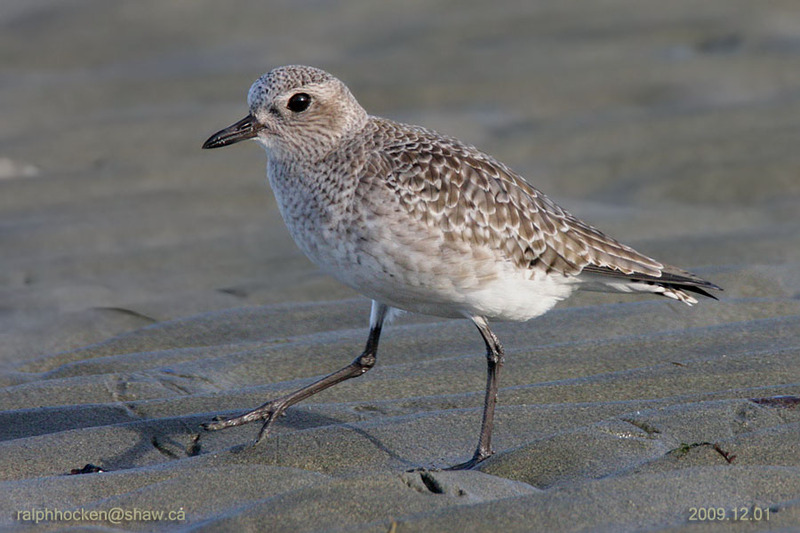 Next Tuesday Birdwalk is to the Little Qualicum River Estuary. Until next week - good birding. number, along with the date, the species and location of your sighting. American Tree Sparrow was seen Sunday Morning at the Englishman River Estuary on the Shelly Road side in front of the viewing stand, feeding with a couple of Dark-eyed Juncos. The morning was cloudy but very nice as there was no wind. The highlights including seeing American Tree Sparrow by the viewing platform, female Evening Grosbeak in the top of a Maple tree and a Eurasian Widgeon in the estuary. Thirteen birders saw and heard the following fifty-two species of birds. Community Park along with the six Snow Geese. Northern Goshawk was seen at Park Ridge Place in Qualicum Beach. Merlin, Northern Harrier, Western Meadowlarks and a Northern Shrike were seen at the Nanaimo River Estuary. Estuary. The morning was cool and rainy with some high wind gusts, keeping most birds hunkered down out of sight. However, we did get a really great view of a Red-tailed Hawk as it sat perched atop an old log. and only a couple of hunters. 15 birders saw and heard the following 30 species. welcome. More information at 250-752-7588. Garret Road about 9:20 A.M.
end of Buttertubs Drive (off Bowen Road). Tuesday birders: Peter Dunn Photo. The Tuesday Bird Walk on November 09, 2010 will be going to the Plummer Road side of the Englishman River in Parksville. We will meet at the Parksville Beach Community Park, at the parking area in front of the Lions Playground at 9 A.M. or at the corner of Plummer Road and Shorewood Drive at about 9:10 A.M.
We will meet at the Parksville Beach Community Park, at the parking area in front of the Lions Playground at 9 A.M. or at the viewing platform at highway 19a and Garrett Road in Qualicum Beach at about 9:20 A.M. The Tuesday Bird Walk on November 23, 2010. will be going to the Rathtrevor Provincial Park in Parksville. 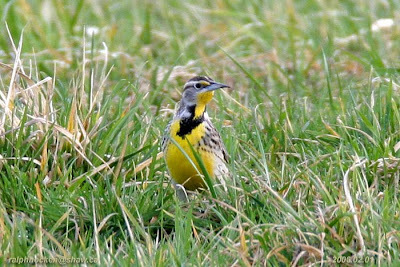 The Tuesday Bird Walk on November 30, 2010 Will be going to Deep Bay. We will meet at the Parksville Beach Community Park, at the parking area in front of the Lions Playground at 9 A.M. or at the parking area at the Deep Bay Marina at about 9:35 A.M. The Tuesday bird walk went to the Shelly Road side of the Englishman River Estuary in Parksville. The morning was sunny and quite warm. The winds and seas were calm. The highlights included seeing eight Snow Geese at Parksville Bay before the walk. A Hutton's Vireo and a Warbling Vireo were gleaning insects on a tree just off the trail along the river. We spotted a Gadwall, a Common Goldeneye and a Eurasian Wigeon in with a large flock of American Wigeon near the shoreline. A Cooper's Hawk was perched in a tall conifer tree along the river. A Short-eared Owl flew over the estuary and quickly disappeared. We watched as a Western Meadowlark perched on a bush near the trail and then flew onto an open meadow to join three other Western Meadowlarks that were perched on the root of a log. We had great looks at them as they posed for us. We spotted a Northern Shrike perched on a bush. Northern Shoveler, a Canvasback, several Ring-necked Duck, two Greater Scaup, Bufflehead ,Common Merganser, Bald Eagle, a Redtailed Hawk. We saw the other birds on the following list at Pebble Beach.